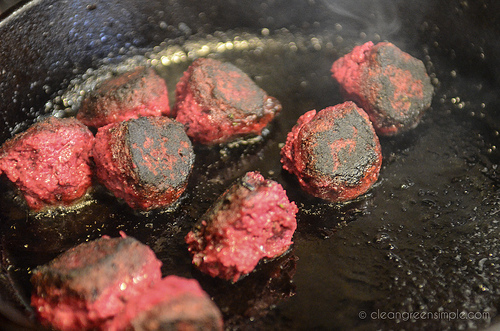 So these are like meatballs – but made with beets! Hence, beetballs. If, when making or serving these, you feel compelled to loudly and repeatedly sing (to the tune of the old Batman theme song) “Dana Nana Nana Nana….BEETBALLS!” just know you do so with my full understanding and support. Also I’m sorry if I just put that in your head. You can also throw in a handful of parsley or some spinach, it’s a great way to sneak in some greens. On a side note I wonder why it is that greens get such a bad rap? People are always talking about ways to sneak them into food, like they are so healthy but just taste awful and need to be masked. I love leafy greens! They taste great! Raw, sautéed, baked…they are so flexible and really just as tasty as any other vegetable group. 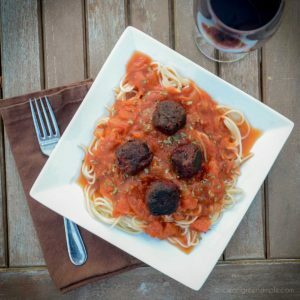 So I take it back – don’t sneak any greens into these beetballs, add them proudly as another delicious ingredient that adds flavor and complexity to the dish. Okay, side note over, back to the recipe. Once they are evenly heated you can serve them immediately – in spaghetti, with gravy, whatever you want to do. You can also shape them into patties and pan fry or grill, just like a burger. This recipe makes about 30-40 meatballs or 6 patties, and you can shape the raw dough and freeze it for later if that’s more than you need. If you make burgers, they go great with my thousand island dressing or my chipotle mayo! Combine all ingredients except flour in a large bowl. Blend with a stick blender or food processor until very smooth. Add flour 1/2 cup at a time until the mixture is thick enough to form into balls or patties - it will get more stable after it cooks, it just needs to be firm enough to maintain its shape while you cook it. Shape mixture into small balls or patties and sauté in oil in a skillet over medium high heat until evenly browned on all sides and heated throughout. Serve immediately. This sounds sooooo good! I can’t wait to try them. And I think that the brown rice flour is a great idea… it becomes kinda granulated as it cooks (it sticks to each other like over cooked rice does) which would give it a great meaty texture. I make a low sugar brownie recipe that gets a nice percentage of brown rice flour for the same reason… the grainy texture simulates the mouth feel of sugary brownies but without actually using sugar… love the stuff, it’s so versatile. 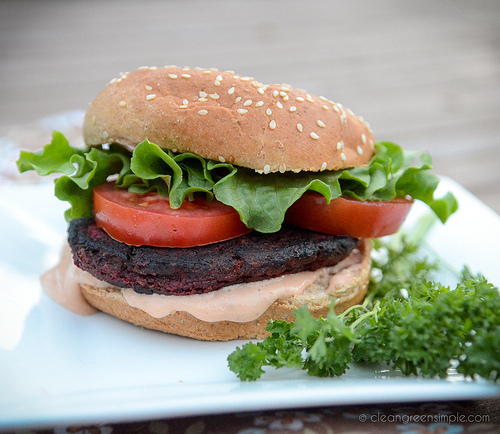 This is the HONEST truth: I’ve been CRAVING a beet burger all week! There this charming restaurant in Houston called Tiny Boxwoods and if you blink you’ll miss the place. They have one of my most favorite dishes–the beet burger– and I was just telling someone I need to revisit the place. Well, maybe not, after all! Will definitely try these soon! Wow, Sounds great. 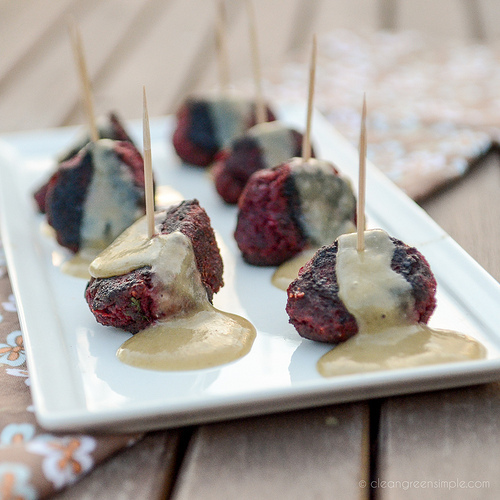 The beet balls looks so delicious…and the beet burger..oh my! Gorgeous ! What’s the weight of one can of black beans without the water? I just have raw beans, so I need to know how many beans I should cook. Well one 15oz can of beans is equal to 1.5 cups of cooked beans, and they essentially double in size from dry, so about 3/4 of a cup of dried beans should work. If that’s not enough you can always add a bit more flour when you’re mixing everything together. These look awesome, I love this idea and I am so going to try this!! Made these over the weekend, and we love them. We ate them right out of the pan as they cooked, so haven’t had a chance to try them as burgers yet. Excellent recipe! Five stars all the way. I am going to try these on Derek! See if he can tell they r not meet. Sounds yummy! this was good!!!! thank you for making VEG fun!! i love them!!! the patties were easier. the meatballs were challenging to move around without messing up the shape …but practice would probably help! thank you again! These look amazng- love beets! 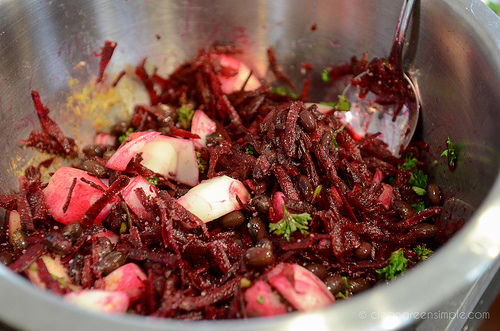 If I am using fresh beets, do you pre-cook them (i.e.) 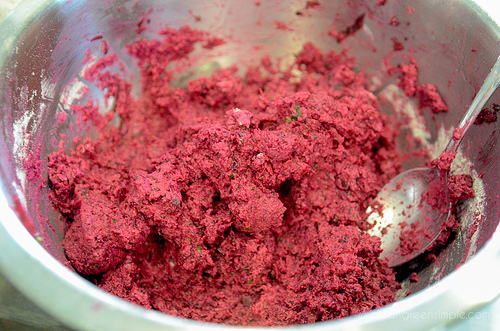 bake them or are you using canned already shredded or grating fresh beets ?? Thank you! These look wonderful! Are the beets cooked, or raw? OMG these are AMAZING! 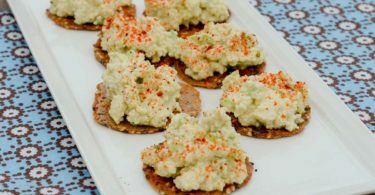 I made these for veggie lovers and two that don’t like veggies and the two guys loved it. 1-10 rating they gave it a 9! i just failed on making it look like meatballs instead we made them look like lil wontons or something. haha. Marinara sauce mix with the gravy… and ketchup on the side… so good… I’m going to make it as a hamburger pattie next! Thanks for sharing all these healthy yummy incredients! 5 Star all the way! Do you cook the beets prior to shredding them or after? We made the beet burgers tonight. Fantastic! 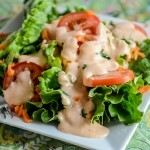 We added our own thousand island dressing made from Earth Balance mayo (no soy, egg, etc. ), since I’ve had a hard time making the homemade mayo, without egg, thicken. Our two young boys also enjoyed them. With this recipe we were able to make 5 burger patties and 12 beetballs that we are freezing for later. Again — LOVE these! !